The Step Stool's design is dual height to accommodate toddlers of all ages. Made from durable, lightweight plastic, each stool is reinforced to hold up to 150 pounds in weight. Each corner also features 4 rubber grips to maintain traction on the floor itself as well. EXCELLENT VALUE WITH MAXIMUM SAFETY Each set comes with 2 stools per order. Easily stackable, our item is an incredible value and allows you to easily stow away a stool in the kitchen and bathroom at a great price. The stool features a dual height design, allowing your child to safely step up and accommodate toddlers of all heights. Each stool can hold up to 150 pounds. With a non-slip at each corner, the stool is designed with stability in mind. SAFETY FIRST: We understand how important safety is for your toddlers. 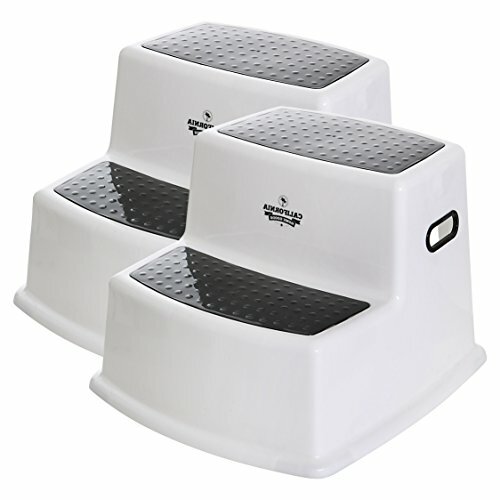 We've injected non-slip rubber inserts under all four corners of our step stool to ensure that when your children step onto the stool it won't budge. We took it a step further and placed textured and contrasting colored rubber inserts on each step of our kids foot stool to maximize grip and safety. The step stool from California Home Goods is designed for your growing child's safety and well-being. LIFETIME GUARANTEE: We are so confident in the quality of our stepstool at California Home Goods that we offer you a lifetime guarantee. Our factory warranty is only available from the authorized seller California Concepts. If you're unhappy with our kid foot stool, please reach out to us so we can improve your overall experience.